The family of Shahab-3 warhead variants as compiled by Tal Inbar and Uzi Rubin. The NRV, the New Reentry Vehicle, is shown on the right. Note it’s a triconic design but with a larger base diameter than the Ghadr-1 warhead. Wonk-friends Tal Inbar and Uzi Rubin are reporting a new warhead variant for the Shahab-3 family of missiles—and hypothesize that it will soon show up on the Sejiil solid-propellant missile. This new variant, also a so-called “triconic” design (why tri -conic? It has always struck me as “bi” conic. ), got me wishing I had done a full aerodynamic analysis of “old” triconic warhead when it first appeared. Well, better late than never. 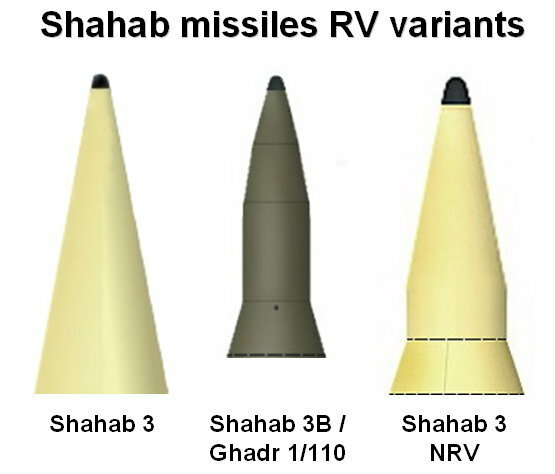 Now I can compare all three designs: the conical warhead that appeared first on the Shahab-3, the “improved” warhead design that is often associated with the Ghadr-1 missile, and the New Reentry Vehicle (which Inbar and Rubin call the NRV, a naming convention I will adopt here). The coefficient of drag, Cd, for the three warhead variants is shown here. Note that the first “triconic” design flown by Iran has the highest coefficient of drag, the new reentry vehicle (NRV) drag coefficient is slightly lower but still greater than the simple conic warhead. As that first break approaches the rear of the warhead, any differences between the simple cone and the NRV should go away. That’s arguing purely on a continuity argument, which is perfectly valid but would have been more impressive if I had seen it before I ran the Cd calculations. On a perhaps more physical basis, it is possible that this decrease in Cd is related to the fact that the shock wave originating from the first break in the aeroshell is much closer to the shock wave originating from the second break. This proximity could reduce the amount of energy radiated in the shock waves, but I’m just guessing here. These differences in drag coefficient have only a very minor effect on the trajectory of the warhead as it reenters. Let me emphasize that the “normal” triconic RV only matches the reentry velocity and acceleration profile so well because its base diameter—and hence its area—is considerably smaller than the other two base diameters. Refresh your memory of the design by looking at the graphic from Inbar and Rubin at that top of this post. When I take the same design and simply increase the flaring at the rear to fit the Shahab-3 rocket body (i.e. increase it to 1.25 m), then the triconic warhead slows down considerably. In fact, it nearly reaches terminal velocity and “gently floats” down to Earth. Well, if you consider 310 m/s floating. As far as ascertaining the purpose of this evolution of warhead designs is concerned, the drag coefficient associated with each warhead variant is probably less important than the question of stability during reentry. Stability of any projectile using aerodynamic forces to achieve stability—either an guided rocket or a reentering warhead—is determined by the relative positions of the Center of Gravity (Cm) and the Center of Pressure (Cp). For any such object to remain stable, the center of gravity must remain in front of the center of pressure stability of a missile (either rocket or warhead) that relies on aerodynamics to keep on a straight path is determined by the relative positions of the center of pressure and thecenter of gravity. If the warhead is going to be stable in a “pointed end first” attitude as it reenters, the center of mass must be forward of the center of pressure. If it is not, the warhead will start to tumble. The positions of the Center of Pressure (Cp) and Center of Gravity (Cm) for the three Iranian warheads assuming a uniform fill from tip to back. Note that all three are unstable when completely filled because the Cp is in front of the Cm. Note that the vertical lines are the positions of neutral stability, where the positions of the Cp and Cm are equal. If we fill a warhead to less than its neutral stability point, than the warhead will be more stable on reentry. If we fill it past the point of neutral stability, it will be more unstable . Note that the simple conical warhead appears to be a better choice since its neutral stability point takes a fill that is closer to its rear. (This is the place I got stuck on and almost didn’t get past.) But this result is somewhat misleading. 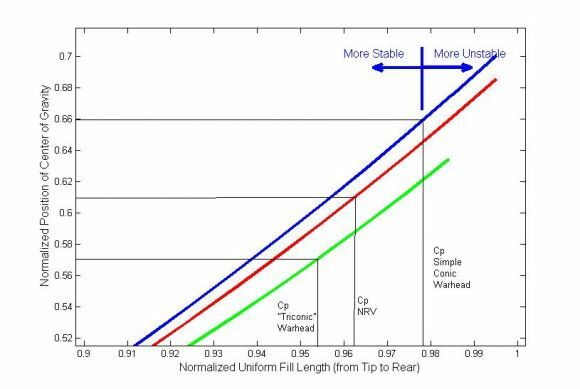 We need to look at the mass of the fill for the three warhead variants—and it turns out that the “central barrel” of the NRV makes all the difference. Truly understanding the reasons for the evolution of the warhead variants would require an understanding of what nuclear warhead designs Iran might use. However, the switch from the initial triconic warhead—which came out some what after the Shahab-3’s simple conical nosecone—to the NRV makes sense for a purely conventional warhead since it can carry considerably more high explosive even the simple cone. 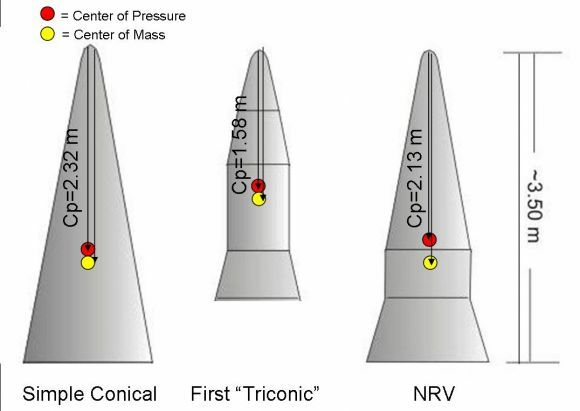 Furthermore, the differences in dimensions of the NRV and the simple cone seem rather minor and would clearly be very dependent of some unique feature of a hypothetical nuclear warhead design. I hope to comment on the calculation later today. Geoff, i think this ‘NRV’ is in fact only a standard Shahab-1/Scud-B warhead(-dummy) mounted on top of a Ghadr-1. The Iranians love to play little games like this, especially with equipment they show in parades. There’s for example also a standard-Shahab-3/Nodong-A fittet with the conical guidance compartment and triconic warhead of the Ghadr-1 around (i’m talking about the ‘missile’ with the number EV3.E003). A cylinder is a cone that has its apex at infinity, so the new front end is triconic but then that makes the old one quadraconic. Thanks Blowback. That actually helps. simorgh, I apologize if I have inadvertently mis-attributed something. Im sure you and Tal Inbar can iron out exactly what has happened. Triconic is geometrically correct but not very descriptive, since it blurs the definition of a classic N-conic design. A classic biconic or triconic design starts out with an acute taper, and then has frustum sections that become closer and closer to cylindrical, approximating an ogive. 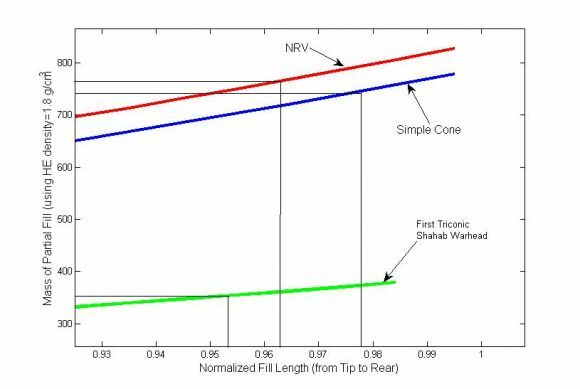 The NRV design on the right could more descriptively be called a “cone-cylinder-flare”. “CCF” sounds like gobbledygook, though, and doesn’t really distinguish the new and old designs any better. I’d call them the simple, the small CCF, and the long CCF if I were naming them. Geoff, thank you for a very interesting post. I am a bit confused, however. The “new” RV to which you refer appears to have been displayed on a mock-up missle during a parade, circa 2005, judging from the date on the link provided by Tal Inbar. The large size of the aerodynmaic fins would be consistent with early versions of the Shahab-3M/Ghadr-1. This leads me to conclude that the configuration was a preliminary one; one that we have not seen on a flight-tested model of the missile. I would also note that if the NRV were fully loaded the mass of the overall RV (about one ton) would significantly reduce the maximum possible range of the Ghadr-1, possibly making it incapable of striking targets is Israel unless launched from vulnerable positions along the Iraq border. This brings me to an often neglected topic when assessing Iran’s missiles: the warhead/RV mass is the key variable when calculating range. Much has been argued about the Sajjil’s maximum range (see Postol’s and Rubin’s exchange on the subject), but little is directed at the more important question: how much would a notional, first generation Iranian nuclear weapon weigh? It would be an interesting topic for discussion on ACW, as many of the readers may have some interesting insights!! The new RV have been displayed on April 18, 2010. Where exactly is the guidance compartment in case of that ‘NRV’? Don’t you think that a standard Scud-B-warhead fitted to a standard Ghadr-1-guidance-frustrum would be a much better explanation for the observed geometry? Please take a closer look (and some photo-measurements wouldn’t be amiss, either). Note that the baseline missile is a standard Shahab-3/Nodong-A with large fins, not a stretched Ghadr-1/Nodong-B (?) with fins of the same size as the Scud’s. Especially consider where the cable duct ends. Also note that the whole missile is considerably shorter than a standard Shahab-3/Nodong-A or Ghadr-1/Nodong-B (?). I thank you for the drawings of missiles. I would like to see MORE quality drawings – of the Sejill, Safir and Simourgh. As for the alteration of the RV of the Ghadr – please note the “brake” in the forward section. This, TEL interoperability and tooling economics are the reason’s I assumed the Sejjil 2 and the Shahab-3 share diameters. But if we assume that the Iranians have designed a nuclear reentry vehicle than we must assume they already know the mass and dimensions of their nuclear payload. Just from eyeballing it the diameter seems to be roughly 60-70cm. It also seems a little short to comfortably fit a gun type device. So what sort of device fits the confines of this RV and masses under <750kg? Of course it could simply just be a conventional warhead since no evidence points otherwise. Can I ask a (maybe) dumb question? Why would you ever design the warhead with a straight (cylinder) section. It seems like it would always be better to connect the straight section through the next downstream conical section. In that way, the rarefaction at the top of the cylinder section would be weaker and also the subsequent shock(at the bottom of the cylinder section) would not even be present. And, you’d have more volume in the nosecone too. Win, win, win. Maybe the point is that you want to add drag in the tail for stability? The cylinder section accomplishes at least two things: it increases the diameter of the warhead closer to its tip and it allows more mass to be carried in a stable warhead (if it separates). The stability is accomplished by the flaring skirt. Both of these might be important for a nuclear weapon but are also important for a conventional warhead, i.e. the increased mass. Before doing these calculations I had a false understanding of the stability issue for the triconic warhead. In particular, the Cp of a simple cone is farther back than for the triconic and the “increased stability” only arises because of the increased mass carrying capability. I simply did not appreciate that before. I should probably calculate the same sort of things for the complete Shahab-3 missile with all three warheads since I suspect there two I would be surprised. But this exhausted me. Though I doubt Iran is going for a gun type bomb, the core of the South African weapon (their missile warhead version) would fit within either of the larger warheads illustrated. Keep in mind that the US deployed gun weapons in 11” shell packages fairly easily (W-9, W-19) and with some effort into 8” (W-33). The factor of 3-ish increase in required fissile material makes implosion devices very attractive for countries edging into nuclear weapons capability, as they can build more weapons or sooner with the lower requirement. On the other hand, the simplicity of gun type weapons and ability to cold test them without advanced introspective diagnostics may be a net win for other proliferators. I agree that the diameter of the warhead is sufficient for a gun-type weapon, it’s the length constraint that gives me pause. Let me preface my comments by saying I’m not in the ‘assume Iran is going for the bomb and then make everything fit that hypothesis’ crowd. But if this were a nuclear RV, it would seem to require a fairly compact two point scientific package or something more advanced. And furthermore they’d have to be incredibly confident that their design would work. How confident must Iran be that they invested the time and resources into designing an RV for an ‘untested’ bomb? Or has it been tested before? Is this a scaled up U235 version of the North Korean Pu239 device, still a risky proposition, or a reverse engineered pre-existing weapon? This is of course all speculation but if I were a nuclear state entertaining a stealth break out option, the embarrassing experiences of Israel, India, Pakistan and North Korea with implosion devices would tend to push me towards a trustworthy gun-type device or variation, and this warhead doesn’t look like a gun-type. What was “the embarrassing experiences of Israel with implosion devices”? I am amused sometimes to read “facts” on Israel’s nuclear weapons that go into details of design, with not a shred of credible proofs. A question about the pointy end of those RVs: Are they of the “tangent-sphere-cone” geometry and, if so, are there estimates of the radius of the sphere part? The incident recorded by the Vela sat was a test of an Israeli implosion weapon. The device fizzled and only put out ~2kt as opposed to 20-30kt. Most likely the Israelis hadn’t quite mastered boosting yet, not an easy trick, and the core disassembled before enough of the fissile content burned up. Embarrassing? I’d say so. I join Tal’s amazement at the number of unsubstantiated statements people make about Israel’s nuclear achievements. Why do you suppose the device was planned to yield between 20 and 30 KT? Israel would undoubtedly want a tactical nuclear weapon and it is much more difficult to design a purposefully low yield weapon than the standard 20-30 KT. This could be the only type of weapon Israel (with its indigenous capabilities and rumored assistance from France) would need to test. Also, Ive edited your post a bit because I consider it bordering on inappropriate. I have decided not to accept any more discussion in this thread about Israel’s nuclear program. It is not only far off topic but there was too much false information being spread without any attempt to reference a source (presumably because no source exists for the false information posted.) Please feel free to continue any discussion on the Iranian missile program that you would like to comment on but I am going to be Draconian with regards to future posts on Israel’s bomb on this thread . What credible open source materials are out there that deals with the materials Iran is using for the skin of the missiles? Does anybody have the actueal dimensions of the NRV (especially diameters of the different sections?). Let me be clear about the role of moderation, since some people have complained about my policy for this thread of not allowing comments that are solely (or even predominantly) about this the Israeli nuclear program. This is not censorship. It is preventing some people from hijacking this discussion for their own political purposes. And now for a very narrowly focused reply: I do not consider “it is well known that” to be a proper reference. You should know who you are. So I hope I have made this policy clear. I will not allow off topic comments to hijack a post. Oh, yes, I almost forgot. When you make your post purposely offensive, it makes dropping them that much easier. Yes, if you are willing to accept that the ‘NRV’ is just a standard conventional 8F44 Scud-B-warhead on top of a Ghadr-1-guidance-frustrum (see my other comments on this thread). Azr@el: How confident must Iran be that they invested the time and resources into designing an RV for an ‘untested’ bomb? I completely agree, you are creating an imaginary scenario. I think you may not be on the right direction! The number one threat for this missile capability is the ABMD system. As you may know, Iran has a well-defined program to design Advanced Integrated Warheads (i.e., a type of warhead carrying several sub-warheads) to mislead the Anti Ballistic Missile Defense system, e.g., the patriot missile. As you have probably heard in the news, after each test, the top officer always refers to this capability (or its improvement) of the newly designed warheads. So, I think you should also consider this as a valid scenario justifying this revolutionary warhead design. To me (based on my observation and news) this is more realistic. 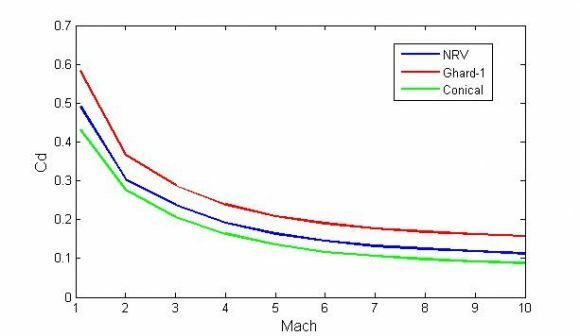 Above figure shows the coefficient of drag related to the Mach number. In aerodynamics (and in hydraulics) the drag coefficients are mostly related to the Reynolds number. In the last part of his trajectory, the speed of the warhead slows down and the warhead passes through air of rapid increasing density and changing temperature. Air density and air temperature govern the viscosity of the air, and air viscosity is a factor in the Reynolds number. Am i right? Does it matter?